Starring: Jordan Peele, Keegan-Michael Key, Tiffany Haddish, Method Man, and more. There come times where comedians come along and stand for a much larger picture than just getting a few laughs out of their audience. They stand for bringing up major issues in the world and bring attention to them in the form of comedy. Lately, two gentleman have done that with their hit show, Key & Peele, and are breaking out to the silver screen. Keegan-Michael Key and Jordan Peele bring their creative humor to the big screen with their newest film, ‘Keanu’. ‘Keanu’ begins by showing the audience the back-story of one key player in the film; Keanu, the cat. After a drug house gets busted by two high-powered hit men, Keanu escapes the house and runs free until he crosses paths with a heart-broken Rell Williams (Jordan Peele). Rell had been broken up with by his girlfriend and was a wreck until an adorably cute kitten finds his way to his doorstep and from then on, it was instant love and comfort. Rell then plans to go out for the night with his cousin Clarence (Keegan-Michael Key) but their night out is ruined the moment Rell comes home to see his house broken into and the newest love of his life missing. Rell and Clarence then go on a personal mission to take back the cat, following any lead they have possible which ultimately puts them among the ranks as undercover gangsters for the Blips led by a man named Cheddar (Method Man), as they do everything they can to get Rell’s dearest Keanu back. I am a huge fan of Key and Peele. Their show was my whole existence and I still go around doing the “I said biiiitch” skit everywhere I go. 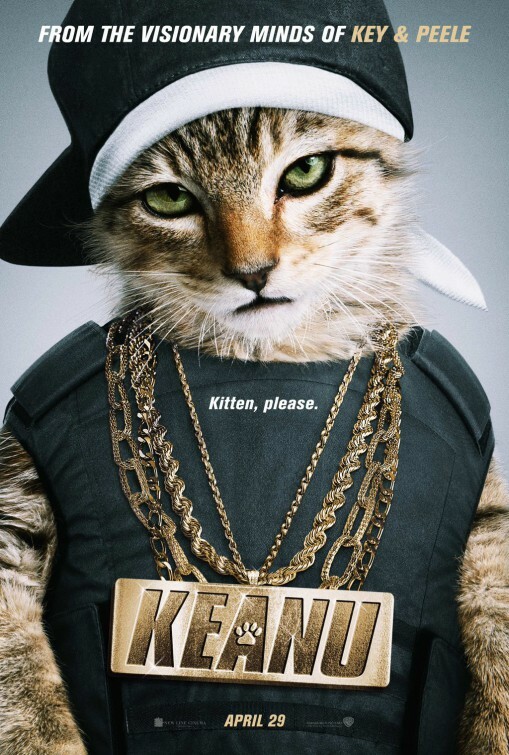 So with this, I was expecting a good bit of laughs to come of ‘Keanu’ but I was left a little disappointed. ‘Keanu’ was not a total fail, it had its moments, in my opinion, but to me it felt like an overly drawn out K&P skit on their show. Mostly a third season skit at that. Key and Peele themselves were naturally hilarious as usual. Their deliverance was perfect, but it was just that the material was beaten to death to me. Overall, not terrible but not great. Just an average comedy from excellent comedians…. The cat was cute though. Posted in 2016 Movies, Movie Review.